Sometimes, the breakfast gods just aren’t smiling at me. 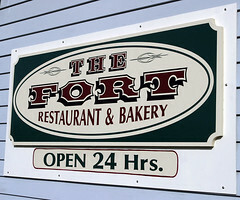 Saturday, Carol and I decided that we needed another breakfast, and so we decided to hit The Fort in Lebanon. I rather like the Fort in a number of ways. It’s neat, there’s almost never a wait, and the food is definitely trucker-approved (most of the clientele is truckers when I’m there). This time, I ordered a breakfast skillet with sausage special (eggs cooked in a skillet with sausage, home fries, onions, peppers, and cheese), and Carol ordered the papas y huevos burrito. Carol rather enjoyed her burrito. And, in the end, I rather enjoyed my breakfast skillet, although it was quite the comedy of errors getting it to me. First time out of the kitchen, the skillet didn’t have any potatoes in it. The second time, it had potatoes, but ham instead of sausage and no toast. The third time was the charm, however, and the wait staff was very good at making sure they got everything right. Unfortunately, the last two times I’ve been there I had similar problems (home fries not being delivered with a meal that plainly included home fries on the menu). In the end, I think this is like the never-working waffle-iron at Four Aces; for some odd karmic reason, if my order contains home-fries it just won’t come out of the kitchen right the first time. Still, I get the feeling this is pesky bad luck and not any real problem on the part of the Fort, so I will keep going back. Indeed, we should probably have a uvScene breakfast there sometime. 1. It’s one of the very few places in the Upper Valley that’s actually open 24 hours a day. 2. I’ve always enjoyed the food quality here. 4. It’s been smoke free for a few years now. 5. Breakfast all day, and they seem good about serving non-breakfast items during breakfast, too. 1. As mentioned above, I’ve had some bad luck here with orders getting messed up. The cruller french toast is amazing. I went to school up there (Dartmouth) and live in Chicago now. Whenever I am back, I have to have the crueler french toast (with real NH maple syrup, of course). I am hungry just thinking about it! The corned beef hash is the best in the Upper Valley. Real, generous shaved beef with potatoes and onions. Nowhere else is better. Believe me, I’ve been to diners and breakfast joints all around there. Although this has nothing to do with food but does have to do with truckers… can anyone tell me why 10-4 phones don’t work at this truck stop. My husband tells me that there is no service there however other truckers are able to use satellite equipment and cell phone. What gives? While not knowing much about 10-4 phones, we’ve got surprisingly bad cell phone coverage around here. I wouldn’t be surprised if whatever cell service 10-4 uses is in a coverage hole. I would like to shead some light on why the service at The Fort might not be up to par latly!! My best friend for 12 years Kelly Bertholdt was a hard dedicated worker at The Fort. Recently she was let go. Kelly is the type of worker that you can depend on. The type that doesn’t have to be told what needs to be done. There was a arguement between her and one of the NEW managers and a side was choosen for whatever reason and it wasn’t Kelly’s. So I believe the way that The Fort treats their employees might be part of the reasons for the poor service!! !